Family Voices of Alabama developed a Care Notebook through its Family-to-Family Health Information Center project. It provides a framework with easily fillable forms for creating your own Care Notebook. Based on our research and experience, we have tried to include the best ideas to help you simplify a difficult task. If you would like to order a free Care Notebook, or any other resources, please complete the Request Information Form. You can also print the entire Care Notebook or individual pages in the download section below. How Do I Set Up My Child's Complete Care Notebook? If you have used the Care Notebook, we want to hear from you. How useful was it? Do you have suggestions to make it better? Please complete a short survey to help us improve our services. 1 - You can download the entire Care Notebook in one PDF file. Reading this file will require the free Adobe Reader 9.0* or higher. The file is large, almost 1 MB in size, so if you have a slow Internet connection, be patient. 2 - Or you can download only those pages you need using the list below. Fill in the forms and save them with your information to your computer so you can easily update them in the future. You will need the free Adobe Reader* to view and edit the pages. Links to the PDF version of each page are listed below. Being the parent of a child with special health care needs can feel overwhelming at times. Your child may need care and services, on a regular basis, from many different types of providers. This Care Notebook was designed to help you maintain an ongoing record of your child's care, services, providers, and notes. It is also a way to maintain the lines of communication between the many service providers that help care for a your child and family. Health professionals often recommend that parents and caregivers bring this notebook to all medical appointments, therapies, care conferences, and on vacations. You can encourage the use of these notebooks by helping clients complete the online Request Information page and mark the "Please send a Care Notebook" box. Health professionals can help us know how we are connection to families by entering their name in the "I was referred by" box. This notebook should be a team responsibility. Medical offices can support families by copying visit notes, immunization records, and doctors' reports and then giving them to families to insert into this notebook. If your client doesn't have internet access, you can give them a printed copy of this order card (mailing instructions are at the bottom - completed cards can also be faxed to 877-771-3862). Please be sure to write your name at the very top, so we know how families found us. Please contact us if you have any questions. Care Notebooks are designed for a 3-ring binder or other notebook which you can easily add and remove pages. Care Notebooks are very personal to your child and should be customized to reflect your child's medical history and current information. Remove pages that are not useful to you and your child. Gather information you already have about your child's health. This may include reports from recent doctor's visits, a recent summary of a hospital stay, names and phone numbers of physicians, hospitals, and relatives, or test results. Store business cards in a plastic holder you can insert after Tab #3. Decide which information about your child is most important to keep in the Care Notebook and file it in the appropriate section. UPDATE the Care Notebook regularly. 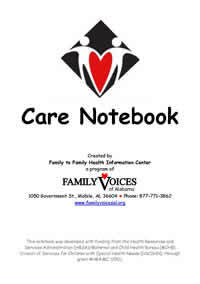 Extra copies of Care Notebook pages will be available for download from the Family Voices of Alabama website www.familyvoicesal.org. ADD information to the Notebook as it becomes available. For example, if you receive new information from health care providers, update the appropriate Care Notebook pages. If tests results are available electronically, request a DVD to store in the provided holder just after Tab #4. Keep track of your child's condition(s) on a regular basis including updating medication changes. Log phone conversations with providers using either the "Doctor's Visit Notes" (found within Tab #4 section) or the "Appointment & Questions Log" (found within Tab #5 section). Track expenses related to your child's care. Store receipts, bills, etc. in a clear pocket you can add in the back of the Care Notebook. This is especially useful to track out-of-pocket expenses for tax purposes. If not, please Contact Us and we will do our best to assist you!